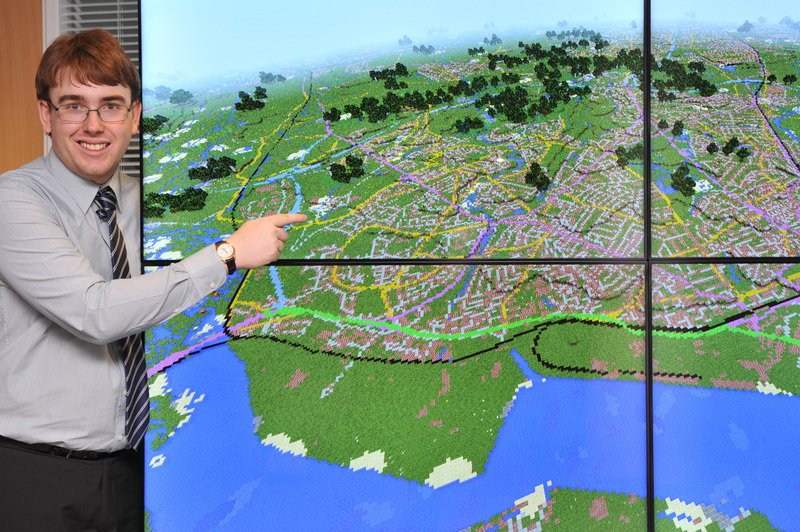 The UK Ordnance Survey’s first draft of its Minecraft map of most of the UK included an impressive amount of above-ground geography and geology. But the newest version is kind of nuts. The 2.0 version of the map is much more detailed, upping the resolution from 22 billion blocks to 83 billion blocks. That’s enough detail that the Ordnance Survey says people should be able to find their own house on it. The first and second version of the map were created by an intern at the Ordnance Survey, Joseph Braybrook (pictured above), using tools that translated Ordnance Survey data into the game. His new version also has trees, more detailed rivers, and roads. It’s now detailed enough to make a fun playground for Minecraft fans. “The terrain has been doubled in scale to provide more detail. It uses 1:25 000 scale OS VectorMap District to give a smoother, more expansive appearance that is closer to real life. Amongst some of the new features I have added are local roads, and I’ve done this using our in-house colour classification system, so motorways appear as blue for instance. The water features now appear in sharper detail; too, so you can see individual streams and tributaries coming off rivers. The forests and woodlands are now populated with generated trees, and the national rail network has been added. I’m looking forward to seeing if people eventually build a working railway system in game. I’ve attempted to recreate Great Britain to be more realistic, while maintaining the gameplay elements people love from the game. I believe GB Minecraft 2 delivers a far greater gaming experience and will present a challenge for gamers to start mining and building on it,” Braybrook said in a statement. You can download the new version of the map here.